Kendall Road truly embraces all that reclaimed boards have to offer. A hand selected grade that features color variation, natural texture from original saw marks and the shape of the natural face. The boards are custom sanded through a series of machines to allow for a smooth finish, but leaving the coloring and traces of the original saw marks. All barn board products will have nail holes, color variation, and natural sound checking. Kendall Road is the location of the Bingham Farm and the site of the original saw mill dating back to 1946. The hand selection and the amount of individual grading and handling involved in crafting this floor is reminiscent to the way things used to be done. 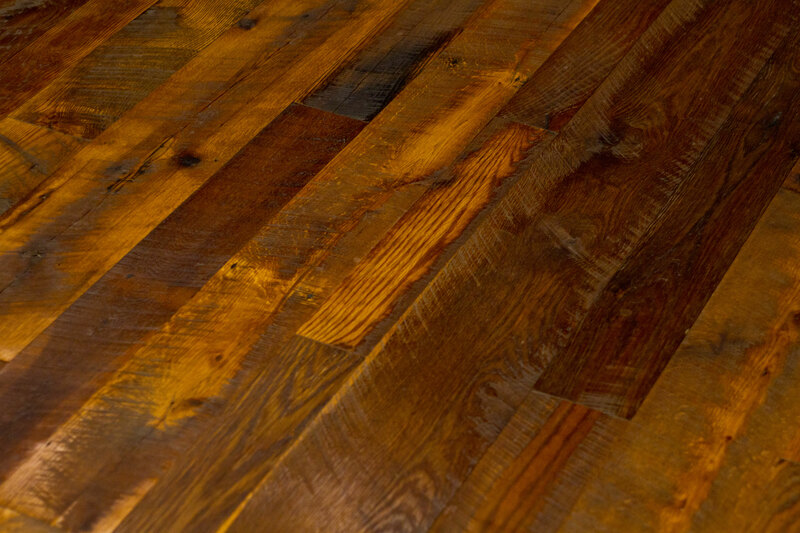 The Bingham Kendall Road custom flooring features reclaimed oak barnboard. Barnboard is found throughout a salvaged barn in mainly three areas; siding, loft boards, and interior partitions. Barnboard that was exposed to the natural heat and the elements has aged overtime creating not only unique coloring, but one of a kind textures. The oak barnboard is found from the mid Atlantic states right up through the Ohio river valley. Bingham values the long time relationships with other small family run business’s to source and reclaim the finest materials our salvaged barns have to offer. * Please note, due to the reclamation process and the natural differences in reclaimed wood, our displays and samples are close representations of a finished product. Each floor is unique and may contain more or less characteristics than represented. Wood is a natural product and because of this we recommend ordering samples of our products before making your flooring choice. We will send multiple pieces of each product to give a full representation of the grade and specie. Together, these pieces represent the grade, specie, or product specified. Please do not reference an individual sample, piece of the sample or image as an accurate representation of the entire grade, specie, or product. Please consult your sales representative with any questions or to request more samples.